There is no egg in eggplant nor ham in hamburger; neither apple nor pine in pineapple. English muffins weren’t invented in England nor French fries in France. Sweetmeats are candies while sweet-breads, which aren’t sweet, are meat.
. We take English for granted. But if we explore its paradoxes, we find that quicksand can work slowly, boxing rings are square and a guinea pig is neither from Guinea nor is it a pig. And why is it that writers write but fingers don’t fing, grocers don’t groce and hammers don’t ham? . If the plural of tooth is teeth, why isn’t the plural of booth beeth? One goose, 2 geese. So one moose, 2 meese? One index, 2 indices? . Doesn’t it seem crazy that you can make amends but not one amend, that you can comb through the annals of history but not a single annal? If you have a bunch of odds and ends and get rid of all but one of them, what do you call it? If teachers taught, why didn’t preachers praught? If a vegetarian eats vegetables, what does a humanitarian eat? If you wrote a letter, perhaps you bote your tongue? . 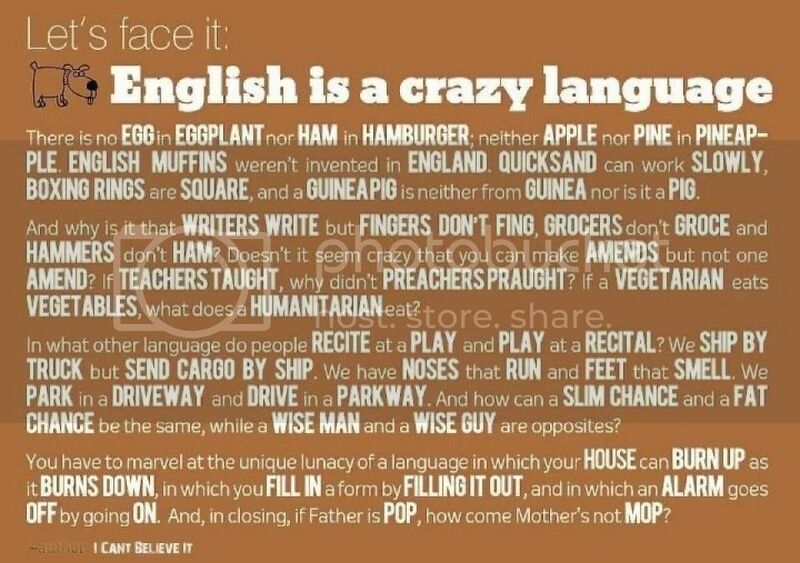 Sometimes I think all the English speakers should be committed to an asylum for the verbally insane. In what other language do people recite at a play and play at a recital? Ship by truck and send cargo by ship? Have noses that run and feet that smell? Park on driveways and drive on parkways? . How can a slim chance and a fat chance be the same, while a wise man and wise guy are opposites? How can overlook and oversee be opposites, while quite a lot and quite a few are alike? How can the weather be hot as hell one day and cold as hell another. . Have you noticed that we talk about certain things only when they are absent? Have you ever seen a horsefull carriage or a strapfull gown? Met a sung hero or experienced requited love? Have you ever run into someone who was combobulated, gruntled, ruly or peccable? And where are all those people who ARE spring chickens or who would ACTUALLY hurt a fly? . You have to marvel at the unique lunacy of a language in which your house can burn up as it burns down, in which you fill in a form by filling it out and in which an alarm clock goes off by going on. . English was invented by people, not computers, and it reflects the creativity of the human race (which, of course, isn’t a race at all). That is why, when the stars are out, they are visible, but when the lights are out, they are invisible. .
And why, when I wind up my watch, I start it, but when I wind up this essay, I end it.